A debut on Live and Loud! 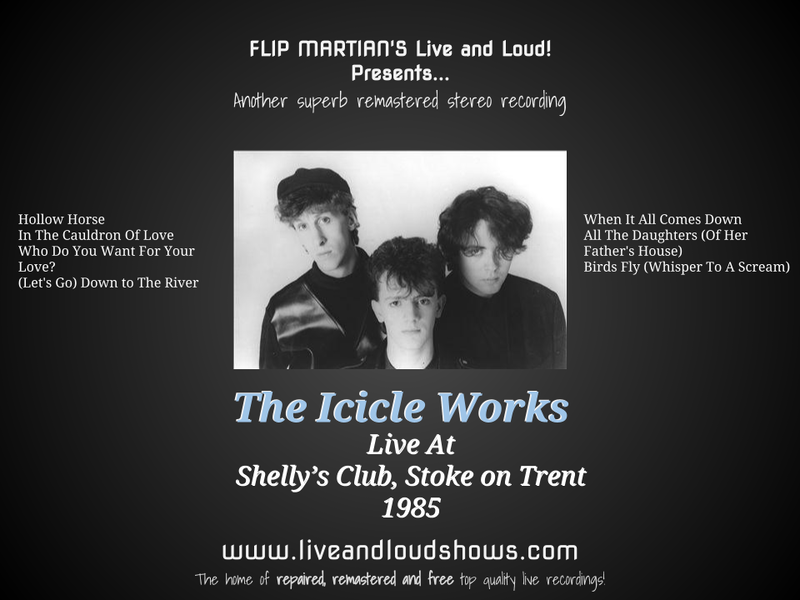 for The Icicle Works, with a show from an unknown date in 1985. This was a flat and slightly tinny sounding recording of an FM broadcast from 8 October of a gig played sometime before then but certainly sometime that year as it features songs from not only their first album but the second album too - which was released in September 1985. I used a wee bit of noise reduction but mainly EQ to improve the bottom end, make the drums and bass more audible, and get some clarity between the instruments and vocals. You can download this new and improved recording for free here as 1 MP3 file. Or, if you would like to have separate The Icicle Works-tagged MP3s, or even lossless files in FLAC format, head on over to the Donations tab to see how you can obtain these for a very small donation towards the site costs. Thanks Phil, another cracker from the archives! Thanks for all you do!! When it all Comes Down & Perambulator from this gig, were played live in a Whistle Test outside broadcast that I recorded at the time. I have it listed as September 1985 but no actual date. Might well be September then - guessing Beeb recordings were broadcast reasonably quickly after recording back then. Cheers for that!